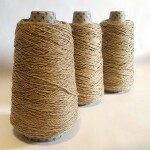 200g cones of very strong, beige and fawn (undyed) pure linen in a range of thicknesses. 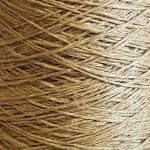 100% pure natural coloured linen is twisted up to create strong, versatile yarns in a variety of thicknesses. In order to provide a range of weights we source our yarns from anywhere we can in their single form and ply them up. The single, fine linen we use varies in thickness and character so in order to produce a range some yarns may only need 3 strands and others need many, many more, some are hairy and some are smooth. Due to the nature of how we make our yarns the weights of these vary from batch to batch along with the colour and character which may be sandier or fawnier, smooth or hairy. Hence the necessity for stating a wide ranging meterage of yarn on these spools. Linen is ideal for all different crafts requiring a strong, smooth yarn. Though its handle is a little crisp, it transforms after wear and washing, so don’t be put off by its slightly “stringy” feel as some tough love will change it dramatically. The yarn can be dyed to heathery, muted shades due to the base colour having a brown cast. Use cold water dyes or natural dyes for authentic coloured yarns - perfect for re-enactment projects. Linen makes a particularly good weaving yarn in both the warp and weft for all types of loom and to add a decorative, rustic look. Make placemats, table linen, tea towels, cushion covers and bags.